Home Costs > How Much Does Tile Backsplash Installation Cost? How Much Does Tile Backsplash Installation Cost? A tile backsplash is an option many people choose to install in kitchens or bathrooms as a way to protect the wall behind the sink and/or create an elegant design. Although its primary function is protection, a backsplash can quickly become the focal point for those who walk into the room. The cost of having a backsplash installed will vary depending on the size of the job, the type of backsplash being installed, contractor and where you live. The cost of a backsplash will depend on the materials being used, the amount of backsplash you need to install and the contractor you’re using. Take a look at the table below to see what the most popular materials will more than likely cost you if you were to hire a professional. Depending on these factors, it’s best to budget anywhere from as little as $10 to $40 per square feet. Since most contractors will have a daily minimum, be prepared to see total quotes in the $400 to $800 range. 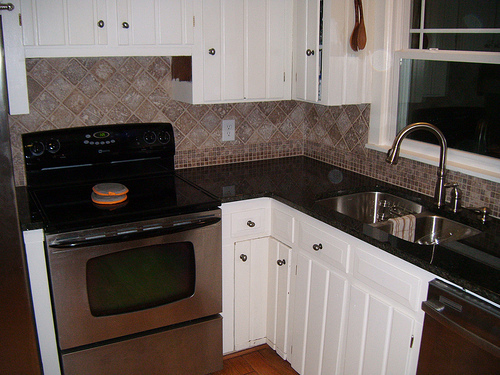 A few members on Houzz talked about what they had paid for their counter tile backsplash install. A few quotes included $812 for 19 square feet, $1,460 for under 50 square feet and $19 per square feet. Even though it seems like a small project, it will still be a two-day job for any professional. The first day will involve the prep work, moving in the tools, installing the tile and using a fast-setting type of thin set to adhere the tile to the drywall. If everything goes well and the contractor has time left in the day, then they will grout the tile, allowing it to dry overnight. On day two, the grout will continue, if necessary, and the tile will be sealed, cleaned and the entire area will be cleaned up. A good contractor should drop cloth in the area, protecting everything in sight, offer good customer service and provide liability insurance. Angles and complex spaces or patterns can often increase the price of the job since it may be harder and more time consuming for a contractor to perform the job. If the pattern were to require more planning and skill, such as a diamond pattern, for instance, then the costs mentioned above could increase the costs by more than 30 percent. Also, if electrical outlets need to be cut or if an edging finish must be done, the costs can increase as well. Cutting a hole for outlets can add another $10 to $20 per outlet. If older tile needs to be removed, this could add another $200 to $500 to the total, depending on how much tile needs to be removed. If the drywall behind the older tile and/or is currently damaged, then the contractor will want to replace it as well. Replacing drywall can cost about $100 to $200. Adding a medallion in the center can cost $200 to $300 per addition. Before you purchase a batch of tile for your backsplash, purchase a few tiles to make sure it matches the appearance you’re envisioning. Also, according to an expert on Angie’s List, you will have to realize when the countertop meets the backsplash, there will be a small gap since it can’t be installed tightly due to the movement between the two. If the tile were to be installed flush against the counter, it could cause the tile to pop off. Instead, a concavely curved piece can conceal this joint and offer a visible barrier of any separation. If you’re remodeling your kitchen and need other jobs done such as replacing a countertop and/or cabinets, then you may be able to receive a discount if you bundle your jobs together. If the contractor will install the tile you purchased, consider checking out local hardware stores or distributors for tile on clearance. No matter where you live, there’s a good chance there’s a handful of tile contractors in your area. Because of this, try to get as many quotes as possible to see what the going rate is in your area. HomeAdvisor.com, for example, allows you to explain your project and receive free bids online.